The Madlib Carnival with Madlib, Pete Rock, J Rocc and Moodyman; Dusky, Shy FX, Congo Natty feat. Congo Dubz and Tenor Fly, George Fitzgerald, Loefah, BADBADNOTGOOD, Kate Tempest, Yung Lean, Araabmuzik, Toddla T and many more revealed in second wave of artists. They join Jurassic 5 and Roni Size Reprazent Live at the opening concert, and Run The Jewels, Boy Better Know, Wiley, Noisia, Flatbush Zombies, Jeru The Damaja, The Beatnuts, Digital Mystikz, DJ EZ, Goldie, Mount Kimbie (DJ set), Cutty Ranks, David Rodigan, Protoje & The Indiggnation, Tippa Irie and many more. An abandoned fort, a 2000-year old Roman Amphitheatre, a beach, boats and a moat all feature at this stunning festival in Pula, Croatia. Outlook celebrates its 8th year from Weds 2nd – Sun 6th September 2015. 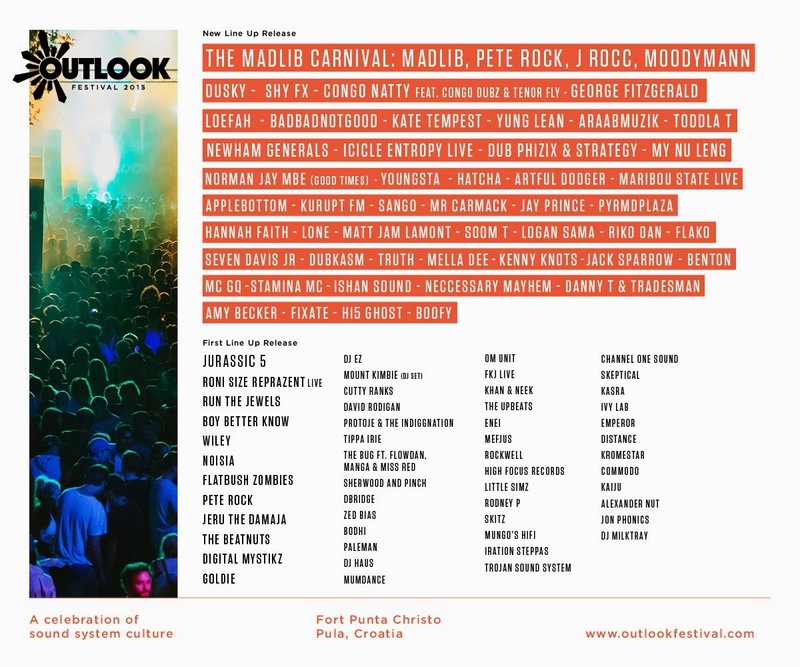 Returning for its 8th season in Croatia, Outlook Festival has just announced its second wave of artists. Taking over the stunning Fort Punta Christo across September 3rd–6th, an abandoned 19th Century warren of dance floors, spaces and passageways which looks over the Adriatic Sea, the new names add even more scintillating depth to an already majestic event. Uniting the very best performers across dub, reggae, hip-hop, drum ‘n’ bass, garage, grime, dubstep, house, techno and electronica, Outlook is a hand-picked curation of the world’s taste-making icons and music and cultural pioneers. 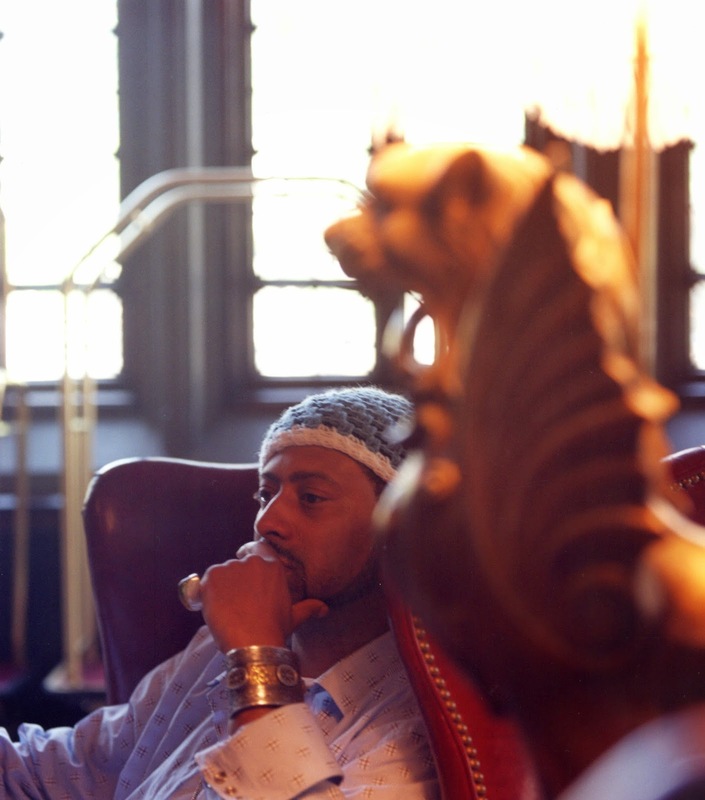 Madlib is a true living legend, a critically acclaimed hip-hop DJ, producer, MC and collaborator who has worked with everyone from J Dilla to Erykah Badu. Outlook sought to build a programme of music with him in as perfect an environment possible in which to hear him perform. The idea of The Madlib Carnival was born with his team, and together they and Outlook have curated a lineup featuring some of Madlib's favourite producers and DJs across an arena for a full 10 hours of Madlib and friends doing what they do best – rocking the party. Madlib is joined by fellow luminaries Pete Rock, J Rocc and Moodyman who star at this stunning takeover. 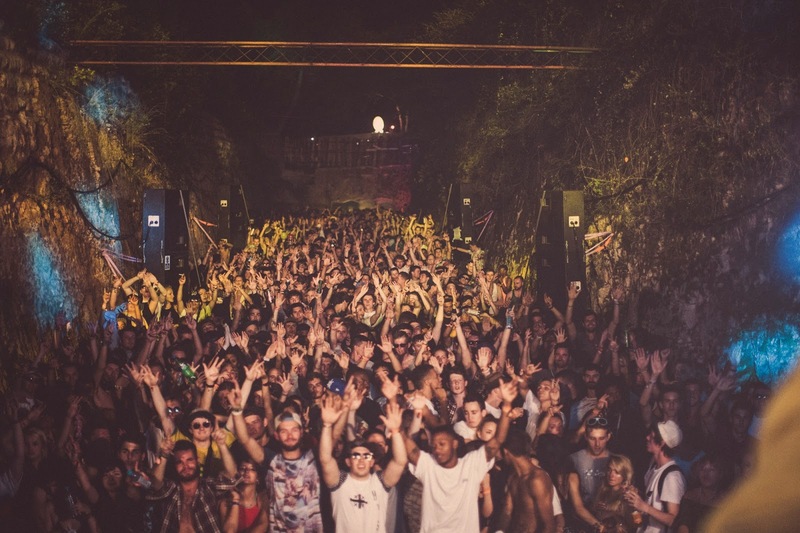 Over on the house and techno tip, Outlook serves up some brilliant artists. In just three years Dusky have asserted themselves as leaders of the UK underground. 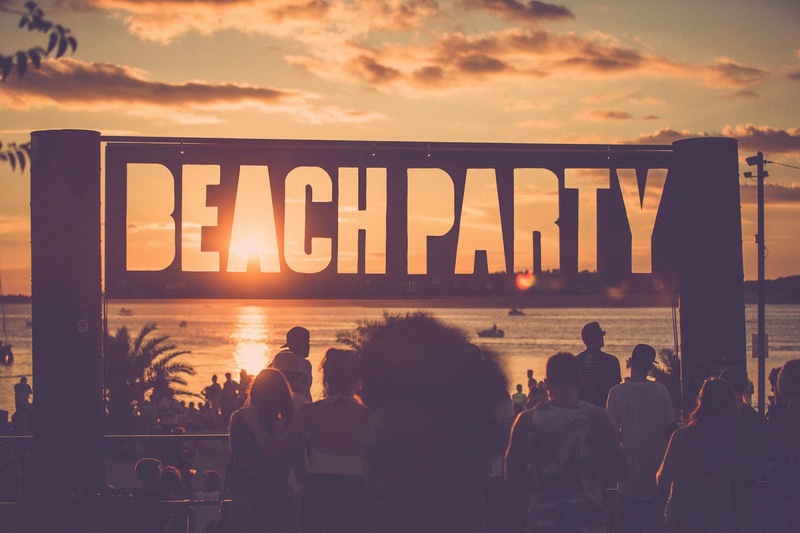 BBC Essential Mix of the Year contenders, DJ Magazine cover stars and headliners everywhere from Berlin's Panorama Bar to London's Fabric, Dusky's story is one of constant forward motion and a uniquely universal appeal. George Fitzgerald is one of the UK’s most prominent figures in the house and bass crossover scene; the Berlin-based British DJ and producer has his much-anticipated debut album, Faded Love, coming out in April. Radio One’s Toddla T brings further genre-spanning sounds to Outlook, with plenty of bass, bounce and party vibes from around the world. On a disco tip, Norman Jay MBE is a venerable and venerated legend; a pioneer of Good Times in every respect, from his seminal Up On The Roof parties to the Notting Hill Carnival, he brings some party-time funk to Croatia. Maribou State’s Chris Davids and Liam Ivory have steadily built a glowing international reputation as these two prime exponents of electronica continue to evolve, and Lone brings his lauded techno and house to Outlook, one of the UK’s most exciting producers. 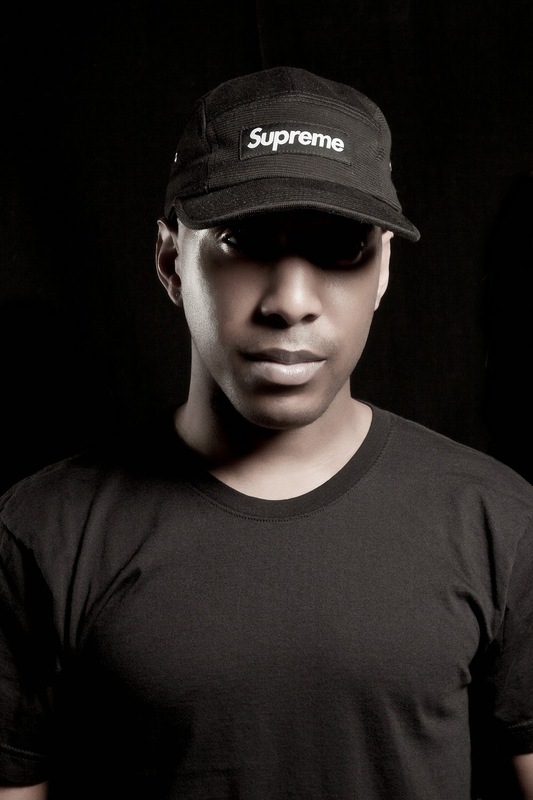 Shy FX is one of jungle and drum and bass’s most revered names and most recently won the Red Bull Culture Clash as part of Rebel Sound; he is without question one of the original pioneers of his respective scenes. Leading the Jungle Revolution is the amazing Congo Natty feat. Congo Dubz and Tenor Fly; the lauded Rebel MC blends African-inspired rhythms and street-tough urban sounds. The seminal work of producer pioneer, Loefah has been formative in the creation and development of the now worldwide scene of dubstep. 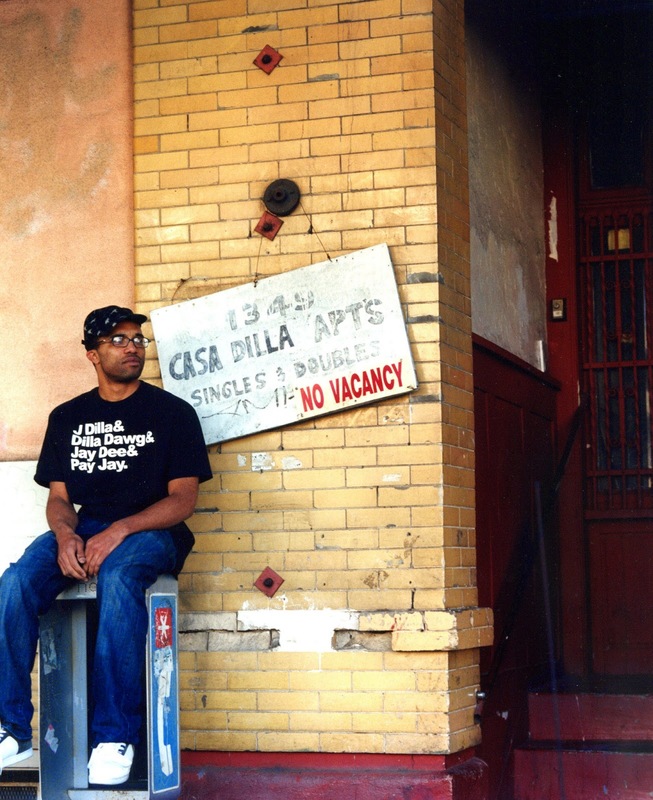 Along with his partners, Mala and Coki, he started and continues to run the now infamous DMZ brand. Heavyweight crew the Newham Generals – aka D Double E, Footsie and DJ MS1 – bring crowd-rocking grime; as perennial Outlook faves they are always welcomed back. Shogun Records’ founder Icicle brings Entropy LIVE to Outlook. This is high-octane, relentless drum and bass which will have Fort Punta Christo shaking. AraabMuzik employs samples arranged and triggered in real time on an MPC drum machine, utilising samples from a wide variety of music, including electro, dubstep and gabber. Outlook regulars My Nu Leng draw on many varied influences, traversing the whole spectrum between pitch shifted vocals and bass heavy rumbles, with the Black Butter outfit always on point. Youngsta needs very little introduction; one of the figureheads of dubstep since the very beginning, he is a long-running resident at scene-defining club night FWD>> and the DJ who first played some of the genre's most-loved anthems. Seminal dubstep DJ and producer Hatcha joins Artful Dodger who bring their 2-step garage to the festival too, huge crowd pleasers each time they perform. Canadian trio BADBADNOTGOOD have already made a name for themselves with their retro fusion of jazz and hip-hop and have collaborated with Tyler, The Creator, Leland Whitty, Frank Ocean and Ghostface Killah; their music dances across genres to spellbinding effect. The Mercury-award nominated and Ted Hughes Prize winning Kate Tempest is an enchanting song-writer, poet, playwright, novelist and singer, heralded as one of the brightest British talents around. She brings a brand new edge to Outlook. Yung Lean is widely regarded as one of Europe’s most unique rappers; the Swedish artist released his debut album, Unknown Memory, in September to great acclaim, and has been packing out stadiums around the world. Soulection are an inspired record label, radio show and niche collective of creative music makers worldwide. The LA-based crew have developed their reputations through their white label series and weekly radio shows, and it’s their eclectic parties which have elevated them higher into the underground’s echelons; the collective’s members Sango, Mr Carmack, Jay Prince, Pyrmdplaza and Hannah Faith will all take Outlook to a different level. Support comes from Applebottom, Kurupt FM, Matt Jam Lamont, Soom T, Logan Sama, Flako, Seven Davis JR, Dubkasm, Kenny Knots, Necessary Mayham, Ishan Sound, H15 Ghost and Boofy. Run The Jewels (El-P and Killer Mike), Boy Better Know (JME, Skepta, Jammer, Frisco, Shorty, Solo 45 & DJ Maximum), The Madlib Carnival (Madlib, Pete Rock, J Rocc and Moodymann), Wiley, Noisia, Dusky, Flatbush Zombies, Shy FX, Congo Natty feat Congo Dubz & Tenor Fly, Jeru The Damaja, The Beatnuts, Digital Mystikz - Mala & Coki, DJ EZ, Goldie, Mount Kimbie (dj set), George Fitzgerald, Cutty Ranks, David Rodigan, Loefah, Protoje & The Indiggnation, BADBADNOTGOOD, Kate Tempest, Yung Lean, Araabmuzik, Tippa Irie, The Bug Feat. – Flowdan, Manga & Miss Red, Sherwood & Pinch, dBridge, Icicle Entropy Live, Dub Phizix & Strategy, Zed Bias, Sango, Mr Carmack, Toddla T, Newham Generals, Stormzy, P Money, Big Narstie, My Nu Leng, Norman Jay MBE - Good Times, Youngsta, Hatcha, Artful Dodger, Maribou State Live, Lone, Bodhi, Paleman, Kurupt FM, DJ Haus, Mumdance, Om Unit, Riko Dan, FKJ Live, Kahn & Neek, The Upbeats, Enei, Mefjus, Rockwell, High Focus Records, Little Simz, Rodney P, Skitz, Mungo's Hifi, Iration Steppas, Channel One Sound System, Soom T, Skeptical, Kasra, Ivy Lab, Xtrah, Matt Jam Lamont, Logan Sama, Flako, Kenny Knots, Emperor, Distance, Applebottom, Truth, Seven Davis Jr, Dubkasm, Mella Dee, Kromestar, Commodo, Billain, Jack Sparrow, Benton, Kaiju, Alexander Nut, Jay Prince, Jon Phonics, DJ Milktray, Pyrmdplaza, Necessary Mayhem, Ishan Sound, Amy Becker, Hi5 Ghost, Boofy, Hannah Faith and many more to be announced.